The Community Leadership Alliance started with a small group of people serving on a Task Force brought together by Kathy Kopp, executive director, and Joe Witmer, chairman of the board, Platteville Area Chamber of Commerce. The Chamber had a vision – to expand the pool of volunteers serving on and leading committees, boards, planning teams and work groups in the community. This vision was shared by Tim Filbert, Paul Ohlrogge and Dan Hill – UW-Extension community resource educators in Grant, Iowa and Lafayette counties, Marian Maciej-Hiner, director of UW-Platteville Continuing Education, and others. Task Force members recognized that a formal leadership development program was needed to build the knowledge and skills, motivation and confidence, and capacity of the citizens of the region to serve as change agents and leaders, to ensure the health and vitality of the region’s communities. After researching other leadership programs, the Task Force decided that a tri-county rather than a single community-based program would make it more sustainable – drawing on resources and participants from a larger geographic area. The Community Leadership Alliance was formed as a partnership between the Platteville Chamber, UW-Platteville and UW-Extension. Today, CLA has the distinction of being the only multi-county leadership program in Wisconsin. The partnership received grant funds from UW-Extension in July 1999 to start planning the program and hire a part-time coordinator, John Dutcher. The first class of 30 participants met in January 2000. 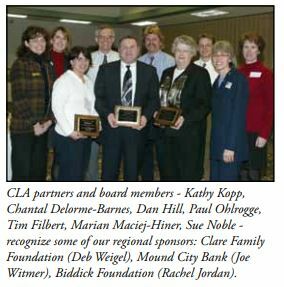 Each year, CLA trains emerging and existing leaders in Southwest Wisconsin communities, businesses, organizations, agencies and institutions – and CLA graduates are making a difference where they live and work in the region.